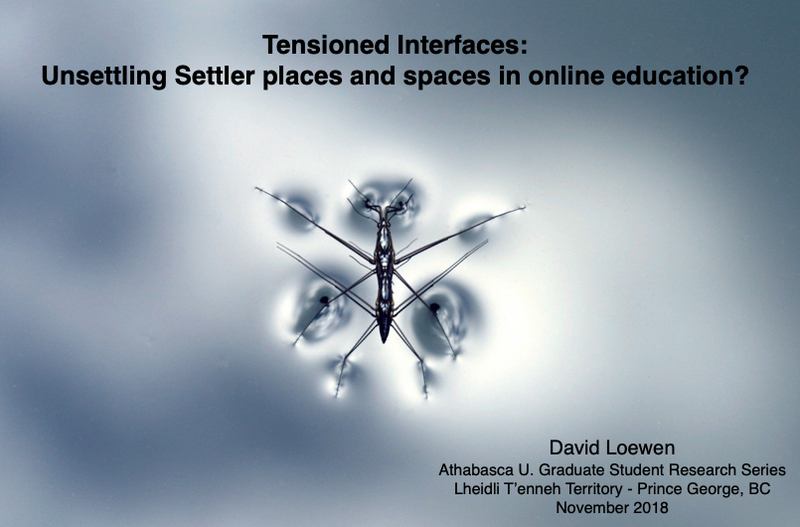 Tensioned interfaces: Unsettling Settler places and spaces in online education? Here is the link to this presentation. This will open in a new window and is within Adobe Connect (you may need to do a quick download to play it). The presentation is approximately 40 minutes long, with questions and discussion taking it to one hour. I much prefer taking a visual approach to Ppoint presentations and avoiding bullets. As pointed out in a previous post - my research is exploring the interfaces between online distance education and the Calls to Action from the Truth and Reconciliation Commission (TRC) on Indian Residential Schools in Canada. 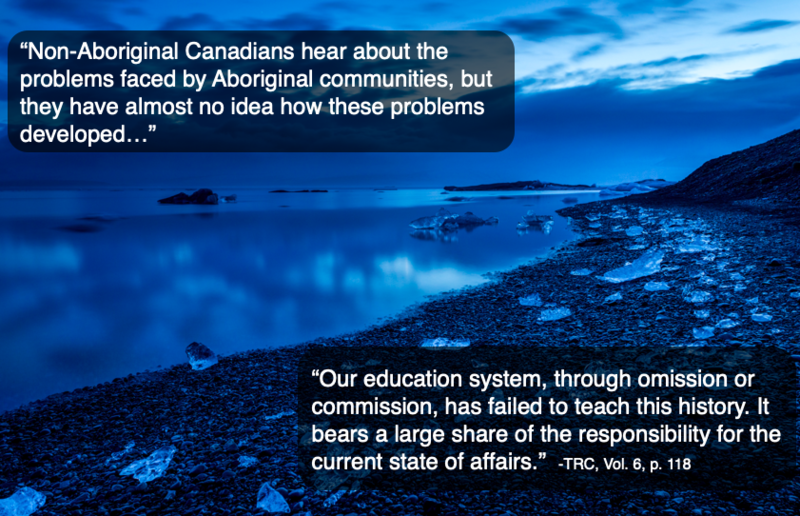 Along with this failure on behalf of education systems within Canada comes the several Calls to Action for non-Indigenous people in Canada to learn. This is a major undertaking - how many people does this equate to in this country? Along with Call #57 are also the following Calls: social workers (Call #1); all medical school students and nurses (Call #24) law students (Call #28); all public service employees including federal, provincial, Territorial, and municipal staff (Call #57); church congregations (Call #59); church clergy (Call #60); students in journalism programs and media schools (Call #86); management and staff of businesses (Call #92); and Calls #62-65 which deal with “Education for Reconciliation” involving curriculum development for K-12 school systems. Yet, the topics or items recommended (e.g. Aboriginal rights and title, Indigenous law, treaties, etc.) - are often complex, nuanced, highly varied between different Nations or communities. Doing this education in a good way will also require in-depth participation of local communities and knowledge holders. However, adding to the complexity of this, some varied institutions are pondering mandatory courses for employees and management to take a course, or otherwise on these topics. The reality of this is that learning, and filling gaps left by the status-quo education system (elementary, secondary, and post-secondary) is yet another complex enterprise. Often when I show this slide in presentations, I share the story of my first face-to-face Orientation session at Athabasca U. for the current program. Arriving into a boardroom with cohort colleagues and faculty, there were small poster sized pictures on the window ledges of at least two walls. This was explained, as a representation of the ‘giants’ in which the shoulders we were to stand on as educators. In the pictures: Piaget, Freud, Dewey, etc. - essentially, all dead white guys. My family background is fully white settler. However, considering that (1) the majority of our cohort identified as female, and (2) my experiences for many years working in Indigenous communities - it was an offensive start to the program - of which I shared - in the spirit of the fact that education, and specifically doctoral education, is intended for ‘critical engagement’ and critical thinking. Yet, I am not entirely surprised, as anyone that has taken a Philosophy 101 course or otherwise, may have noticed that 99.9% of the philosophical theorists and theories explored, are also of European descent. The Greeks: Plato, Aristotle, Socrates. Then spreading through to a variety of other Europeans: Hobbes, Hume, Bacon, Descartes, Nietschze, Hiedegger, etc. These are also being replicated in the growing practice of online distance education.